There are two consumer camps on rebates- those who like rebates, and those who don't. Whichever side you're on, the reality is that you can't walk into most retail stores and not find a deal offered with a rebate. For the time being, rebates are here to stay. Knowing how to take advantage of them (and not the other way around) may help you save money on the products you need. Retailers and manufacturers like rebates because they help promote and sell merchandise, which generates more revenue. Part of those revenues are passed down to the consumer as lower prices, i.e. rebate savings. But these savings are not instant- they require a rebate claim to be submitted, which can take up to 10 or more weeks to be processed, after which you are mailed a check. Meanwhile the company gets to make interest on your money. But how can companies afford to sell products free or dirt cheap with rebates? Many people in fact forget or don't bother to submit a rebate claim. 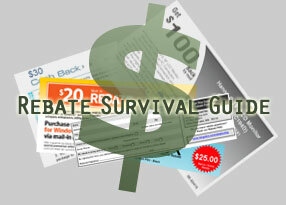 Rebate redemption rates are not uncommonly as low as 60% or even 30%, though they increase with higher value rebates. The consumers who DO submit a claim go through a not-so-straightforward claim process. Some companies get shady with this, trying to find any reason to deny a claim. This includes making rebate forms complicated and easy to mess up, or even not sending the check, hoping that the consumer will forget about it. Nonetheless, rebates aren't entirely dark and sinister. Millions of people each year successfully receive their rebate checks. You can too if you know how to play the game right.